As the African Union Summit kicks off in Addis Ababa this week, Somalia remains swamped in debt, struggling to kick-start a more positive trajectory. Debt relief, a once-hot topic, is out of vogue: Somalia’s debt forgotten, but not forgiven. Instead, Somalia racks up sporadic attention for armed conflict and teetering on the edge of famine. These are the harsh realities, but obscure the change that is underway in Somalia, where the Federal Government has undertaken key reforms that are the pathway to debt cancellation. Reforms that contributed to recent World Bank grants totaling US$80 million and the EU’s first-ever budget support to Somalia for $116 million. Yet with a debt of US$4.6 billion, these grants are drops in a sea of debt. Aside from successful reforms gathering pace, the arguments for expedited, full debt cancellation for Somalia are overwhelming. The humanitarian imperative is clear with millions of Somalis relying on humanitarian assistance, while the debt compounds misery by preventing Somalia from accessing much-needed cash to stimulate development. This is a debt accrued before the collapse of the Government in 1991. A debt accrued before the vast majority of Somalis were even born. This is all well known, yet the international community is caught up in a malaise, tinkering at the edges with piecemeal assistance, ignoring the core problem of Somalia’s debt. This crisis is immense by global standards, but Somalia’s $4.6 billion debt is small change by those same standards. US$700 billion was spent bailing out US banks in 2008, circa US$280 billion bailing out Greece over the past decade, both in the name of ‘global stability.’ Somalia is a priority when it comes to ‘global security,’ yet the international community looks the other way when it comes to a debt that is a noose around Somalia’s future, ignoring or failing to see that cancelling this debt will also contribute to stability. Debt Cancellation for Somalia: The Road to Peace, Poverty Alleviation and Development, a new report by the Somalia NGO Consortium of which Oxfam is an active member, outlines the simple, clear steps for debt cancellation of which Somalia has taken many already. The barrier is a lack of political will. 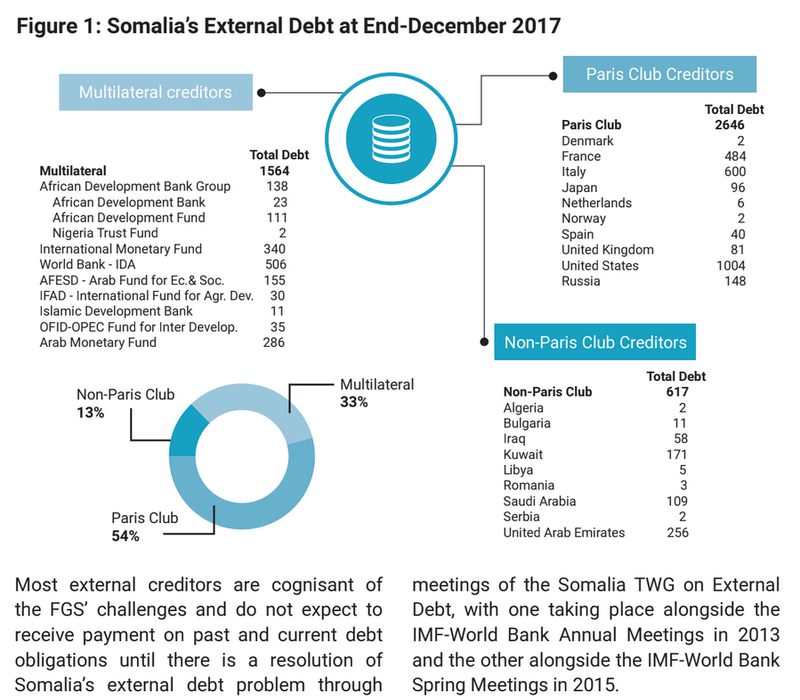 The African Development Bank, IMF, and World Bank are key to getting debt cancellation moving, but other debtors must also jump on board; the US, Italy, and France are key, holding the biggest portions of Somalia’s debt pie (see Figure 1). To date, only China has provided full debt cancellation. Hence a growing consensus that Somalia needs debt cancellation champions. Liberia and Sierre Leone benefited from the US taking such role, but in the current global climate, who is willing to step up? The African Union and Organisation of Islamic Countries are some amongst many that express compassion and solidarity with Somalia, but the time has come to step up, words to actions, suggestions to demands. Skeptics can continue to point towards armed conflict, governance disputes, and many other realities, all of which are major challenges for Somalia. Yet these challenges are also further justification for rejecting the heavily indebted status quo and taking a new approach. An approach where Somalia is not drowning in debt, one where the government has the resources to deliver services and ultimately one where people like Halimo can move from barely surviving to thrive.